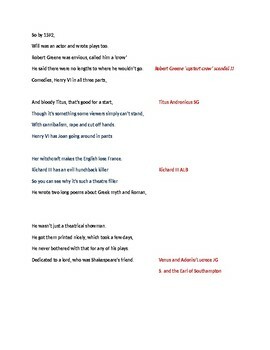 The Shakespeare Rap! 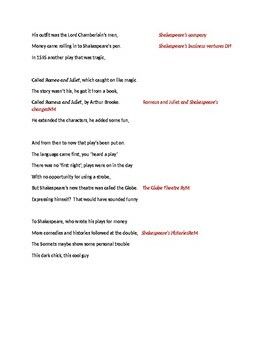 Introduce students to Shakespeare's life and times. 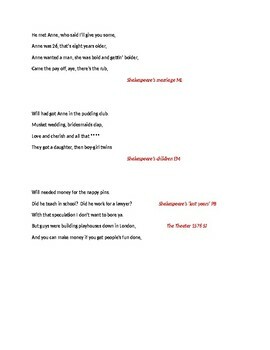 This is a rap on Shakespeare's life and times. It serves an introduction to work on Shakespeare. Divide the class into 4-6 groups. Cut the rap up into a piece for each student (ideally - but if there are absentees it works just as well), and get them to connect the pieces by using the sense and the rhyme. There should also be a rhyme to make connections between groups. When all the pieces and groups are linked, get them to perform the rap. As a follow-up, students can be asked to prepare presentations about the subjects in red, e.g. miracle and mystery play, the Elizabethan grammar school, etc. 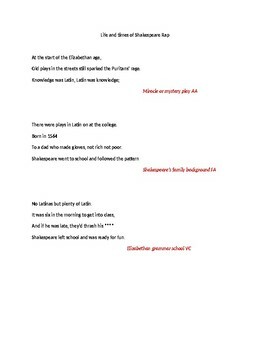 The rap can be adapted to prepare for the particular play the students will be studying. This particular version was written to introduce Romeo and Juliet. If you need help, ask me!